As a vintage lover, I have a small collection of colorful spice and other small tins. Starting from the left, Handi-Tape Band Aids, Sauer's Pure Flavoring Extracts, McCormick Curry Powder, McCormick Dry Mustard, McCormick Paprika, and Nature's Remedy Vegetable Laxative Tins. 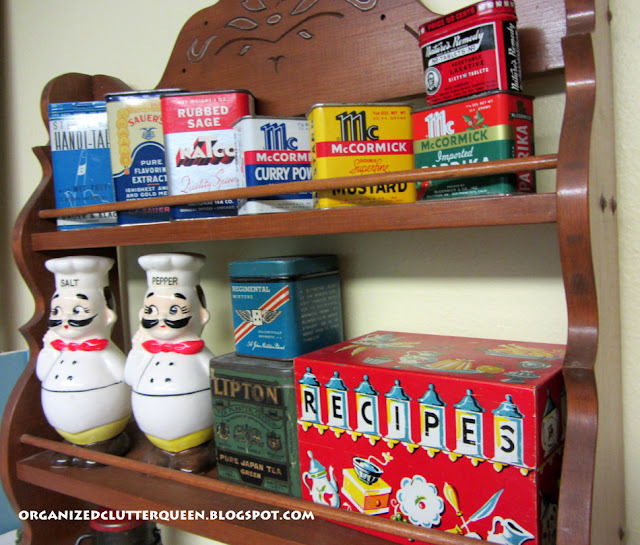 The tins are displayed in my laundry room, just off the kitchen, in a vintage, wooden spice rack. This is my favorite type of tin, all metal. Some manufacturer's went to a tin body and plastic top in later years. Other small tins on the spice rack include the Regimental Tobacco Tin, Lipton Tea Tin, and vintage recipe box. 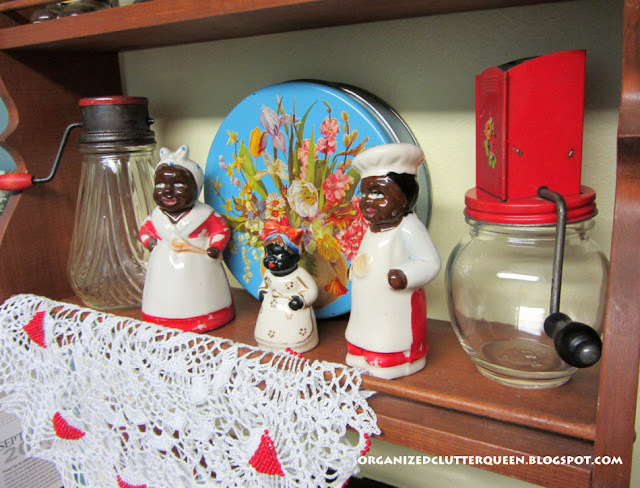 The bottom shelf of the spice rack has two vintage nut grinders, a round turquoise tin, and three salt and pepper shakers. I love red. The doily has red seed beads crocheted right into it. Remember my old Western 354 wall phone from an earlier post. The spice tin rack is right above it. 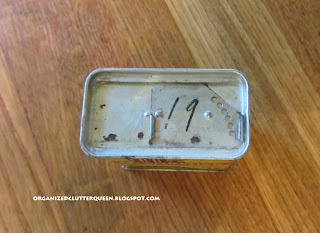 Are you a fan of vintage tins? Your wall is perfect, the phone and photos bring is out more. Those chef's are my favorite! 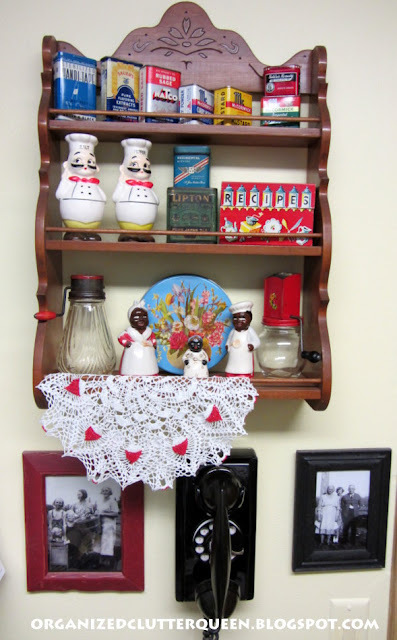 Love your shelf and all the vintage items! You have a nice collection of spice tins. 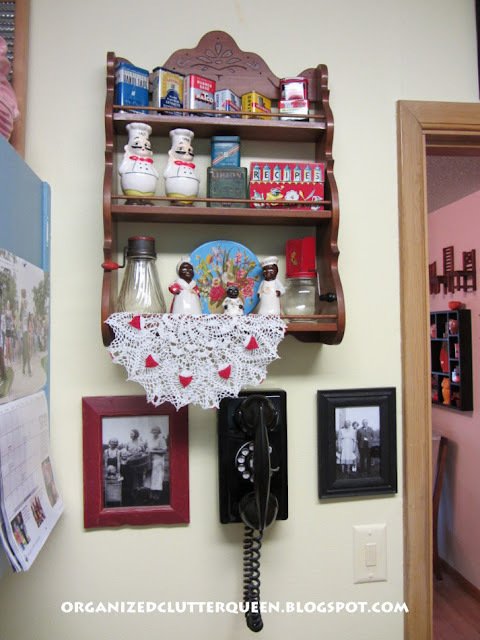 I did, too, until I painted my kitchen and sold all the red and cream colored tins in a garage sale. Of course I could kick myself now. I love tins! And your phone rocks too! Love your tins. The little shelf on the wall holds so many cute things. I still have an old rotary dial phone in my kitchen. The kids across the street think it is the neatest thing ever!! What a great collections of tins. Love your shelf. I wish I had one of those nut grinders. It would come in so handy, especially this time of year when we are making so many things with nuts in them. 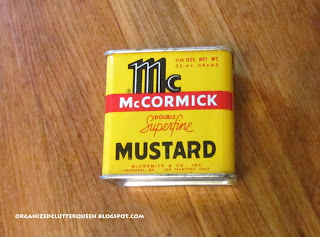 Of the tins, I most remember the mustard tin. We always had McCormick Dry Mustard on hand at our house when I was growing up. Sweet memories. 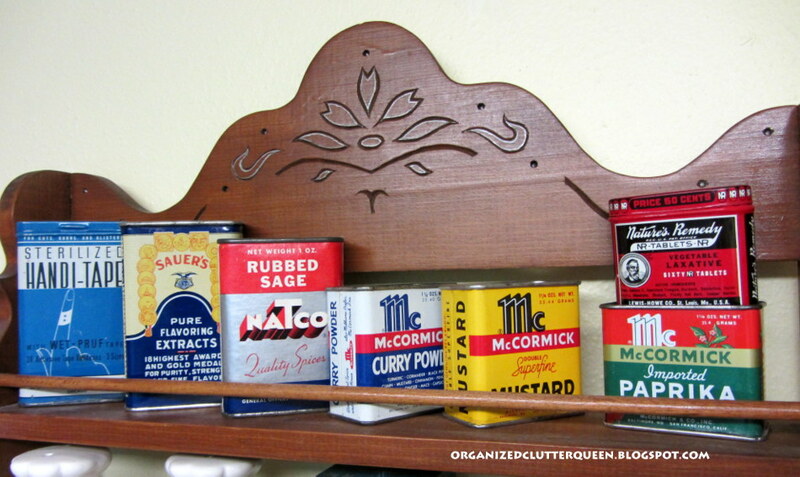 I remember Grandmother's cabinets filled with tins like this. Wish I still had them. You have a wonderful collection! I have a set of spice tins that would be perfect for you. I bought them for my daughter, forgot I had them and now her tastes have changed! At an estate sale recently i was buying a stack of things and got involved in getting it all in the car. As I was packing the lady offered me three shoe boxes of spice tins. I FORGOT them! I went by the next day, but she had thrown them away and the trash had been picked up. I was crestfallen. Love your collection! I am a fan of your tins for sure! What a great display!